ScreenSnag provides a quick and easy way to take a photo of your computer screen. Capture the entire screen, a region of the screen, a window, or an element on the window with a single hotkey or click. You can also use Timer option to perform captures at intervals that you define. Save any combination of your preferences as a profile and make the capture process quicker and more efficient. 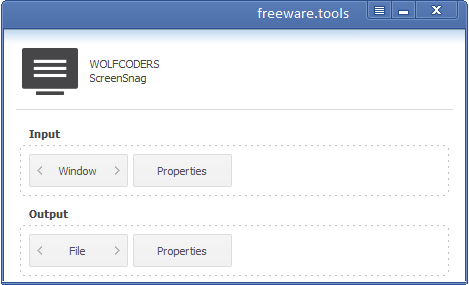 ScreenSnag provides users with the fairly standard options of capturing the entire screen, a particular window, or a specified area of a particular screen. ScreenSnag is a utility intended to provide users with a handy and simple way to take snapshots of the computer screen at any time. Either you want to capture the whole screen or a particular area only, the task can be carried out quickly with a single mouse click or an assigned keyboard combination. Moreover, ScreenSnag integrates a timer function that allows users to take screenshots at convenient intervals. All the program's features can be easily accessed and configured from its interface. Once a set of preferences is defined, users are also provided with the possibility to save it as a profile, thus facilitating the upcoming tasks of the same kind. This comes in very handy if taking snapshots is an action you need to perform more often. You can configure the tool to save the output to clipboard or to picture files. The latter can be in a PNG, BMP or JPEG format. Furthermore, you can choose the preferred image quality, configure the border parameters and adjust the transparency level. However, the hotkeys assigned to various actions cannot be defined by the users. You can only enable the default ones by accessing the Settings window. From here you may also open or change the output location. If you need to edit captured screenshots, note that such tasks cannot be performed within the application. However, you can enable the Edit option and ScreenSnag will automatically open the images in Paint, which you are most certainly already familiar with. Due to the features it integrates, ScreenSnag is an efficient solution for performing basic desktop capturing tasks. If you are looking for an easy to use snipping tool, ScreenSnag is definitely worth taking into consideration.